I've been a long time observer of this forum and have found it useful beyond expectation over the years, so thank you to everyone on here for creating such a vibrant community and resource for information. Now I would like to ask a question for myself, relating to expanding tilesets in Red/Blue. My goal was to add a further 16 tiles to the overworld tileset, thus making a new row in the png file and allowing a bit more detail ingame. Example shown below using the large tree from the forest tileset. However, in game, things aren't looking too flash. As you can see, instead of the tree we're getting tiles from the font. The tile ID of the first new tile in the new row is 0x60, throwing out 'A' and so forth for subsequent tiles. Of course, this is happening because the font is stored in the RAM directly after the tileset, presumedly 60 bytes after the beginning of the tileset. Has anybody here successfully shifted things around to allow for expanded tilesets in Red/Blue? I seem to remember reading something a long time ago about a 255 tileset hack for Gold/Silver, and assuming the graphical data is stored in the RAM the same way, could a similar method be applied? 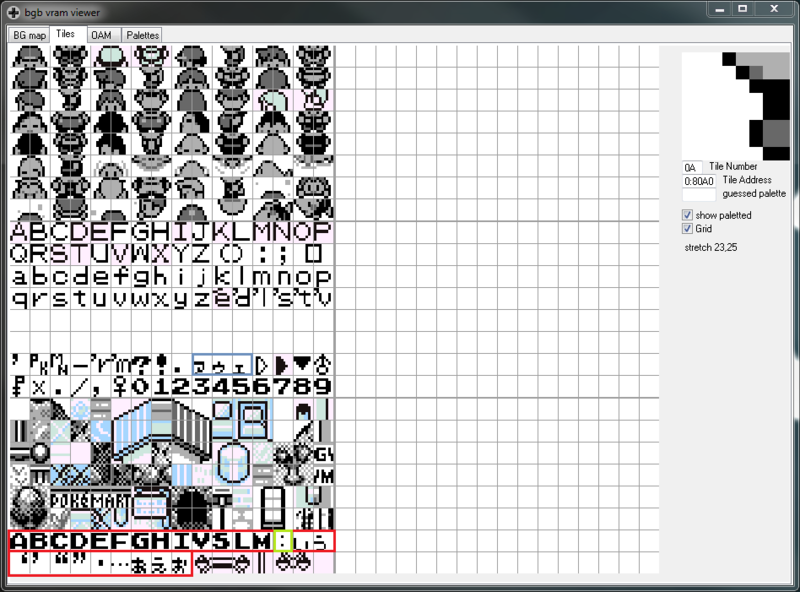 Danny-E 33 if you're reading this, Shanty Town mentions in his thread about RB Map that it supports up to 255 tile tilesets like in Pokemon Prototype. Would you mind sharing how you did it? Thanks for reading and for your help! ShantyTown must have misspoke. My hack uses 256 block blocksets, not 256 tile tilesets. However, you can fit in about 25 extra tiles into the ow tileset. Here you see that the font is actually not right after the tileset. Those tiles after the tileset (and the tiles you see in your screenshot) are unused tiles; a few letters, a few garbage tiles, a few punctuation, and a few japanese characters. 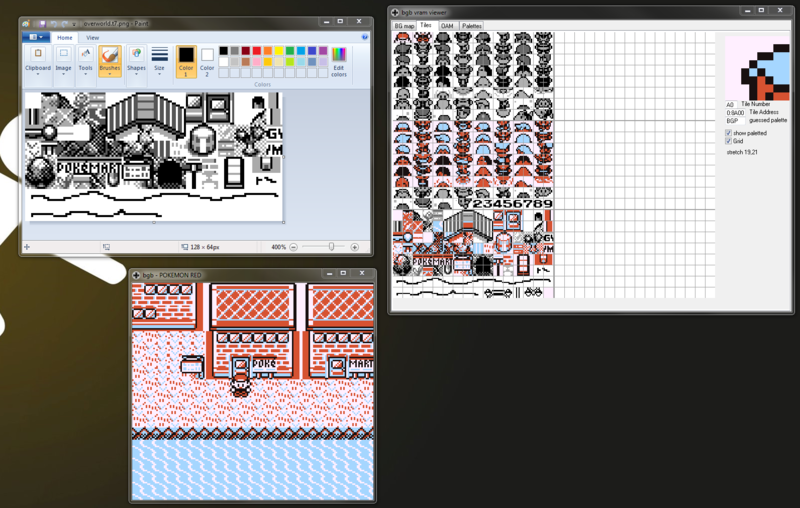 In my image above, I have outlined the unused tiles in red. These are part of gfx/text_box.png. The only tile that I know of that is used from that set is the colon, outlined in green. It is not the ordinary colon that is part of the font. This colon is used when viewing the trainer card and when saving. It is used to display play time. However, on the trainer card, it is loaded separately so you don't even need to worry about it. The only thing you have to worry about is during saving. If you want to use that space for additional tileset tiles, you have to move that special colon tile somewhere else so that it is displayed correctly during saving. I recommend moving it to one of the unused tiles in the font. I have outlined those in blue. This basically skips the first $19 tiles of that graphics file, and loads the remaining tiles $19 tiles further in to memory (so that they are actually at the same place as they always were). Then those first $19 (25) tiles are free to use at the end of the tileset. I'm almost certain those other punctuation tiles (singles quotes, double quotes, ellipsis) are entirely unused, but I could be wrong. If you discover that some of those tiles were used, just move them into the normal font, like you did with the special colon. To test that this all worked, I changed gfx/tilesets/overworld.t2.png to a 128x64 pixel image, and renamed it to overworld.t7.png (the 't' value represents the number of blank tiles that need to be ignored at the end of the last row). This caused bank $19 to be too large, so I moved Overworld_GFX and Overworld_Block from bank $19 to the first empty bank (bank $2d). Lastly, in home/overworld.asm, in LoadTilesetTilePatternData:: I changed `ld bc,$600` to `ld bc,$790` to load an extra 25 tiles when the tileset is loaded. Many thanks for your reply Danny, it was very useful. I did however turn out some interesting effects by expanding the tileset by 25 tiles. This ended up displaying a lot of junk tiles all over the place, including in the intro and all over the overworld when bringing up the start menu, talking to a NPC etc. Would adding a line of code in the right place to reload the current tileset when leaving the party menu fix this issue? I have gone through party_menu.asm and looked for a suitable place to call LoadTilesetTilePatternData but the only place I found under '.done' garbled both the HP bar and didn't quite fix the tiles in the overworld anyway. Any ideas? Relating both to the 25 tile expansion causing major glitches and working around the HP bar drawing issue? Many thanks, I look forward to your comments. So you might have noticed that entering the Pokedex and exiting didn't cause any graphical bugs, because so many new graphics had to be loaded to show the Pokedex that the tileset has to get entirely reloaded to return to the overworld. However, that is the only bug I can recreate, even with the +25 modification. What do you mean bugs with the intro and with talking to npcs? For the same reason that the Pokedex doesn't cause the bug, the trainer card forces a reload of the whole current tileset by calling ReloadMapData. I just had another thought. Tile $00 in every tileset is a completely blank tile. You could use tile $00 for a new tile graphic, and then replace all $00's in the block data with $7f (which is always also a blank tile). Pretty sure no harm could be done by doing that. as it gives the game a fraction longer to reload the tileset. Calling it right before redisplaying the start menu results in a brief glitch being displayed on the tiles before they are reloaded. With regard to the other graphical glitches that you weren't able to recreate, I have just realised that this is probably because I used the code to allow for 25 more tiles, but only included a tileset with a 128x56 pixel image, and 12 new tiles. Hence why amending your code to my specific needs fixed the problem. Good suggestion also on using tile $00. Squeezing every byte out is the name of the game here! It looks like much the same technique would work for pokecrystal! home/map.asm:LoadTileset is responsible for loading the tileset graphics. The last two rows in VTiles2 (right) are, as far as I can tell, completely free. The last two rows in VTiles1 (left) get used for the textbox border, the location sign popup, and a few other things like the phone icon when calls happen. Plus they get overwritten by the trainer card, Pokédex, Pokégear, and HP+exp bars in the party menu. Still, around 40 more tiles should be available! Also add more "tilepal" rows to the tileset/*_palette_map.asm files. Now the metatiles should be able to use tile IDs $e0 to $ff!